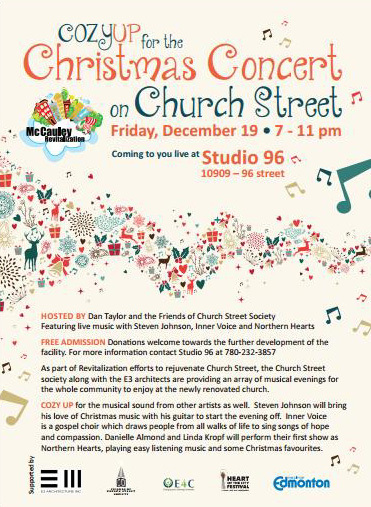 Promoting the historical significance of 96 Street in Edmonton's McCauley neighbourhood. The Churches of Edmonton’s Church Street (updated edition) is now available as a PDF download from the Boyle McCauley News website, along with all of the other booklets in the McCauley historical series – click here for a full list of downloadable booklets! Winter in Little Italy featured sleigh rides through Church Street, in addition to other fun activities during December 2017 – have a look in Boyle McCauley News! Our next all-you-can-eat spaghetti dinner will be on October 10, 2015 from 5 p.m. to 8 p.m., with a dance to follow! Join us in the basement of Sacred Heart Church of the First Peoples (10821 96 Street) for the Friends of Church Street All You Can Eat Spaghetti Dinner! This is a fundraiser for the Church Street Fair, as well as a get together with wonderful people. We will serve gluten free and “regular” spaghetti, and the cheese will be added afterwards, not included. We will also have a vegetarian sauce! $15.00 a plate gives you spaghetti, garlic bread, salad, and a drink. Families (of three or more – two adults and children up to tweens/early teens) for $35.00. On August 14 from 5 p.m. to 8 p.m. join us in the basement of Sacred Heart Church of the First Peoples (10821 96 Street) for the Friends of Church Street All You Can Eat Spaghetti Dinner! This is a fundraiser for the Church Street Fair, as well as a get together with wonderful people. We will serve gluten free and “regular” spaghetti, and the cheese will be added afterwards, not included. We will also have a vegetarian sauce! $15.00 a plate gives you spaghetti, garlic bread, salad, and a drink. Families (of three or more – two adults and children up to tweens/early teens) for $35.00. It is with sadness that we announce this year’s Church Street Fair is being cancelled. We will be able to enjoy open houses at the churches on Church Street on July 11, 2015, but the family activities, the food, the children’s fair portion and music will be cancelled for this year. We are actively pursuing sustainable funding for the future. We truly believe that Church Street is a vibrant part of the City of Edmonton, and as such needs to be celebrated. Please contact us if you can think of organizations who would like to partner with us! An interview with Founder and President Colleen Chapman was filmed for SHAW TV – you can watch it below! Negotiating the best solution for Church Street road bulbs has been about trying to come up with ideas that work for everyone involved. Many of the key people involved have advised the City that the shrubs have got to go as they have served their purpose and need to be removed. The City of Edmonton hears the residents’ message and as a result of resident concerns the shrubs have been replaced with ornamental crab apple trees planted over the summer of 2014. Forestry will be maintaining the trees to ensure they thrive over the next two years. The next steps will be to remove the potentilla shrubs as the ground will be reworked and a mulch base will be replacing the existing hardened ground at each bulb location from 107A Ave. to 111 Ave. before the snowfall in 2014. In preparation for spring, there will be six to eight large pots that will be used to beautify the area for spring planting on the bulbs. If the pots are successful, then more pots will be added to enhance the Church Street area. Plaques have been ordered for the churches that detail the history of each church. Feedback from the community during the Church Street Fair has been helpful to determine the most popular design for the banner flag poles that will mark the entry ways to Church Street which will be installed in the spring of 2015. Work on the street blades continues with transportation and will also be installed in spring of 2015. 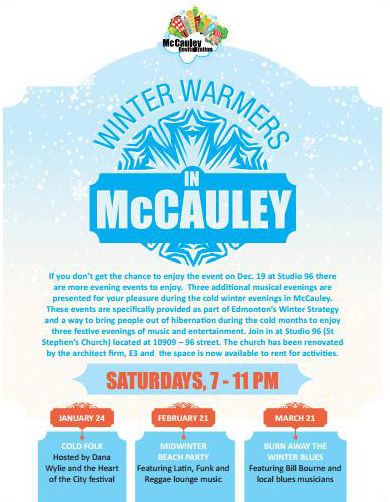 What’s up for those who are the gifted creative people living in McCauley? The Revitalization is working with key people to create a web site to connect local artists and create a link for those who live in the area. There are many projects and opportunities for short term and longer term initiatives that could use your talents. 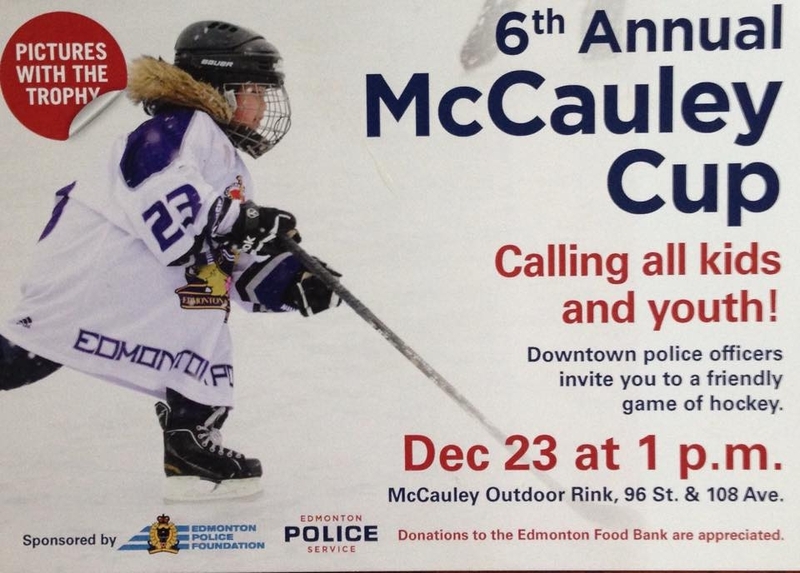 Please contact Yvonne Chiu at (780) 423-1973.